So, I was a little bit of a slacker last week and missed getting up my WM post. Two great accomplishments, though. I brought all of the clothes I had sitting in my closet for consignment. It’s so nice to have that stuff out of here! And, there’s our new rug. It is amazing how much more space it feels like we have. We bought it right before having some people over for the Super Bowl, and since we needed some more seating, we pulled the chair from our bedroom out. It’s been there ever since. I sit in it all the time! When it was in our room, that chair was the spot we would throw random clothes, books, etc. Now it is actually being used as a place to sit! As for this week, I did something that should have been done a looooooooong time ago (we all know how that goes). But you guys! It happened this weekend for a reason! Remember that 9-cube shelf that didn’t fit in the closet? The one that has just been sitting in my living room mocking me? Well, I guess that whole fiasco was meant to happen because now it is serving the perfect purpose. You see, we have two entrances to our apartment. The front one leads into our living room, that’s the one we use daily. The back one leads into our bedroom. It has a storage closet and brings you down to the basement, so it has kind of served as a catch-all area and since no one but us ever sees it, it has never been neat nor organized. I mean, we were literally climbing over things to get to the basement every time we did laundry. I’m really embarrassed to share these pictures, but you wouldn’t be able to appreciate the after pictures without them. See that bookshelf on the right side? That is a minuscule fraction of Andre’s comic trades. They are out here for their own protection for when we have a mobile baby who may otherwise decide to rip every page. Now that we cleared out space in the living room closet, they could be moved there, leaving us room for other goodies. I purged a TON of old medicines and lotions, donated old cell phones back to Verizon (they have drop boxes at every store and the phones are given to victims of domestic violence), and organized our surplus paper goods and some of the other things that were in the living room closet, again freeing up space for Eila’s toys and linens for the pull out couch. Where did I organize these things, you ask? Oh, you know… in the 9-cube shelf that I should have bought for this very purpose! It is a perfect fit and I feel a sense of victory every time I walk out into this hallway. Take that, crooked walls! Left- Lookingout from our bedroom --- Top Right- Coming up the staircase --- Bottom Right, my genius idea to hang our brooms from the outside of the cabinet (above the staircase)- I LOVE it! So there you have it. Our nice, neat back hallway/storage area. Boy that felt good! Linking up over at Jules’ again. Happy William Morris Thursday! This entry was posted in Other good stuff and tagged The William Morris Project 2012. Bookmark the permalink. Get out! It looks amazing!! And thanks for the tip about cell phones and Verizon. I had no idea, and I was just stockpiling for who knows what reason. Whoa! What a transformation and a double Yay for crooked walls! The lighter color of the rug makes a huge difference too. I love the new rug. 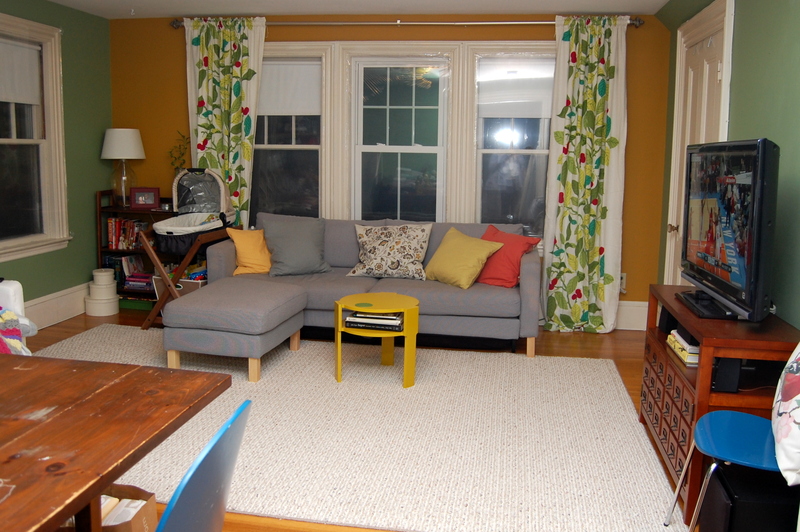 I too am guilty of “too-small-rug-syndrome.” I also love your bright happy colors…that orange/squash color looks very similar to a color I used to have in our family room. Great job!! 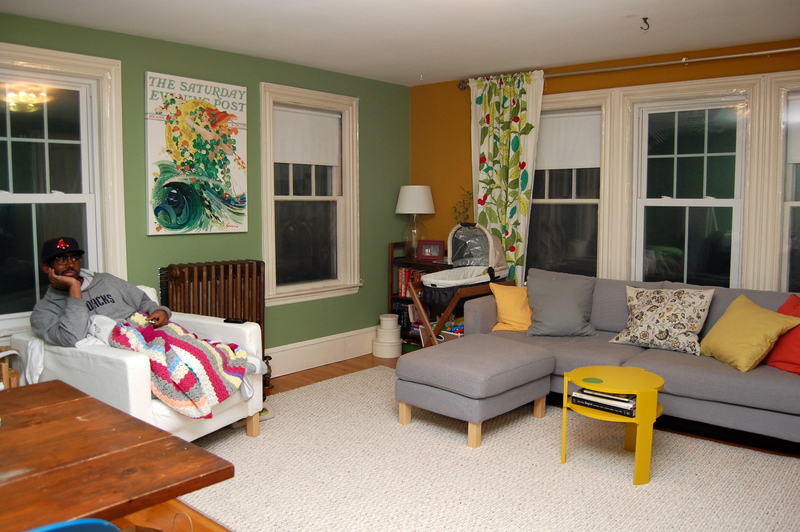 That rug totally brightens up your living room! What a great choice. Isn’t it amazing how a piece of furniture can work so poorly in one space and so well in another, and yet, it takes so long to discover its usefulness? Great, great work (even better work considering you’ve got a little baby! totally impressed). Tidy! 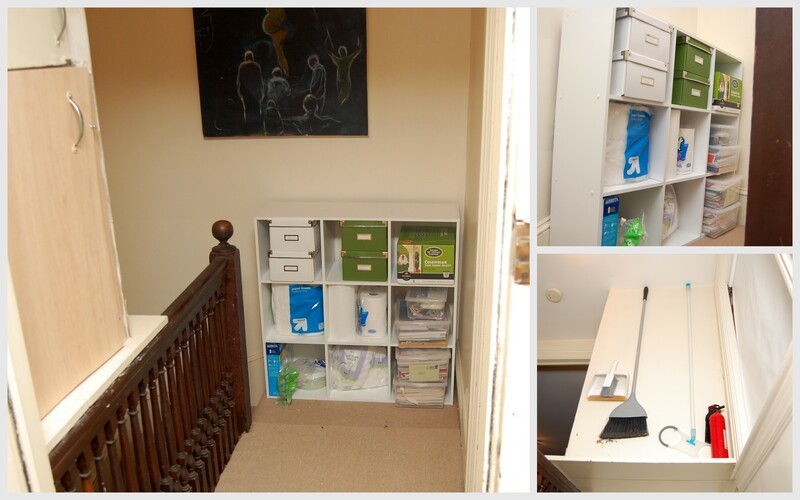 It must have been great feeling to put that 9 cube storage into the perfect spot! I like your rug, too. I have large rug envy! We are currently rockin a way too small rug in the living room. I think a bigger one just moved up the list! 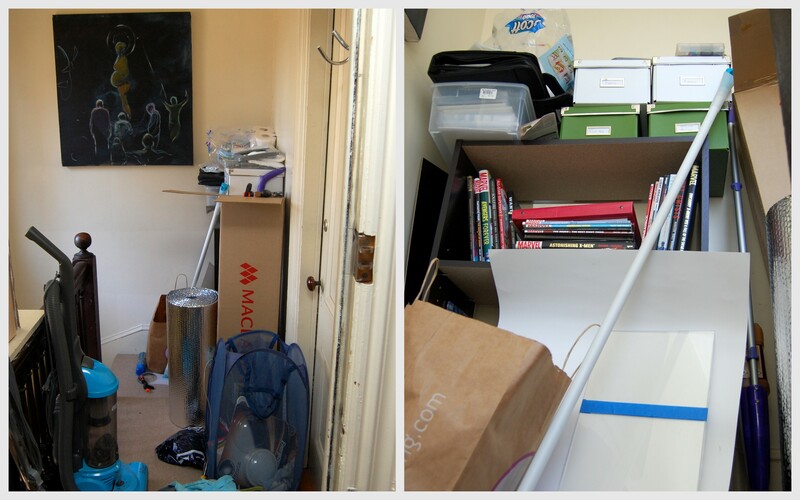 I LOVE messy BEFORE photos to compare to the HUGE CHANGES in the AFTERS! You just wouldn’t appreciate the after as much if you don’t see the before, and your after is AMAZING!! Well done!! I looks great and I know exactly what you mean about getting a smile on your face each time you walk out there. I feel the same way about the rooms I’ve worked on in our house. Well done!! 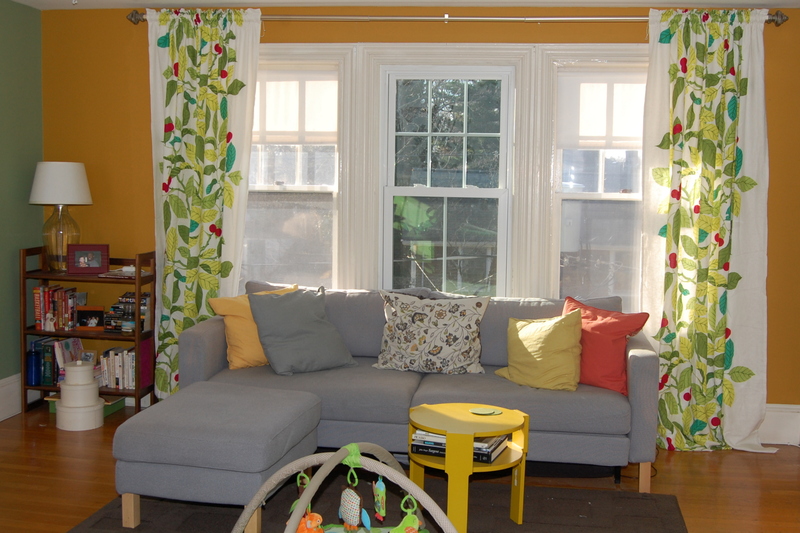 By the way, I love the curtains in your living room – so cheery!